many of his works of art are displayed, he moved to Riske Creek just outside of Williams Lake before moving to his current location three years ago. wall hangings to very large feature outdoor landscaping pieces. Whether large or small, each piece is uniquely designed and sculpted by this talented artist. If not in Ken’s shop in person, you will probably recognize his work around Williams Lake as he has done several pieces for the City. Two are located at the intersection of Highway 20 and Highway 97, and a third piece sits above the Stampede grounds by the Mall. This lone cowboy stands in quiet retrospect of days gone by, his face telling a story. 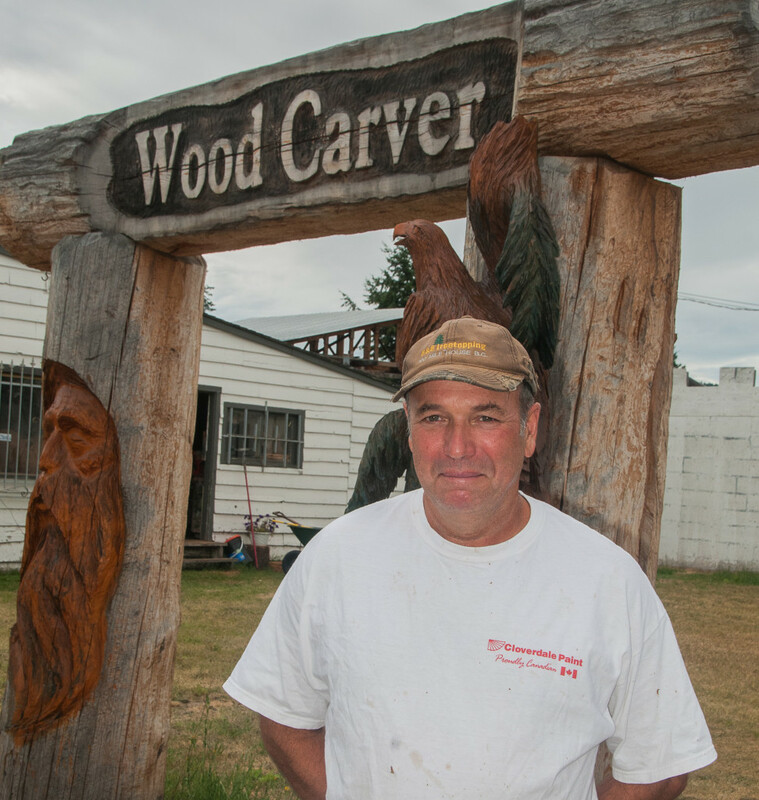 Ken works often for Pioneer Log Homes as a freelancer. Some of his work has been taken as far away as Scotland, one such home featuring twelve eagle heads on the ends of beams. Ken also commissions all over Vancouver Island and to the north, sharing his art with both businesses and individuals alike. creating. This month’s feature artist, Ken Sheen, is a ‘must meet’, and a great way to turn an afternoon into and art outing adventure. Find him at pinerivercarving.com or by taking a lazy afternoon drive up to Alexandria and visiting his show room, and maybe even catching him in his, as Christa calls it, breath-taking, death-defying act of carving.